The unmistakable strut. The overdramatic flop. The flagrant low blow. 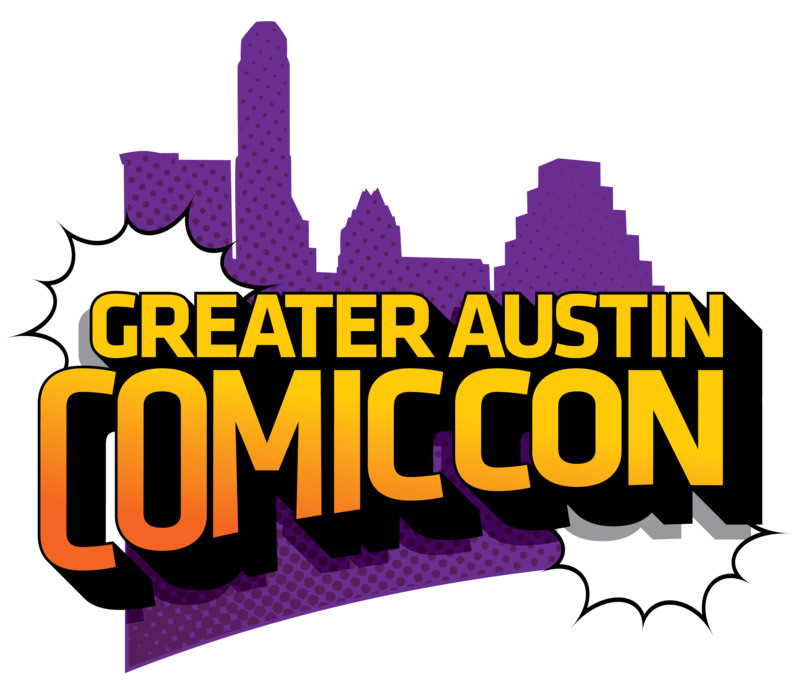 The… "Woooooooo!" Such an animated performer like Ric Flair can't be encapsulated in words. He's a man of vibrant actions and endless sound bites. If Dean Malenko is "The Man of 1,000 Holds," then Flair is absolutely "The Man of 1,000 Faces" – each one more flushed red with intensity than the last. There was a time when Flair didn't blaze through arenas like a fireball of charisma, but that was before he found his calling as "The Nature Boy." Prior to stealing kisses, flying on jets and riding in limousines, the 16-time World Heavyweight Champion was an adopted, brown-haired kid in Minnesota with a chip on his shoulder. Flair showcased his athletic ability early in life, competing in wrestling, football and track at a boarding school in Wisconsin. After winning the state private school wrestling championship in 1966 and 1968, he was recruited to the University of Minnesota on a football scholarship. But it wasn't until he dropped out that he got his first big opportunity as a sports entertainer. Working as a bouncer at a nightclub, Flair met Olympic weightlifter Ken Patera, who introduced the young "Slick Ric" to legendary performer and tough-as-nails trainer Verne Gagne. The 10-time AWA World Heavyweight Champ had quite a class for his wrestling camp in 1971, which also included Patera, The Iron Sheik and Jim Brunzell. From there, it was simply a matter of time before Flair would start to turn heads with his colorful personality and in-ring prowess. There were no cakewalks in the American Wrestling Association, only battles that tested Flair's endurance against combatants like Dusty Rhodes, Andre the Giant and Wahoo McDaniel. Leaving for the Mid-Atlantic region of the National Wrestling Alliance in 1974 looked like a promising choice until a serious plane crash in North Carolina broke his back in three places. At just 26, he was told by doctors that he would never perform again. If Flair was going to defy the odds, he'd not only have to rehab, but adapt. He'd have to wave goodbye to the hefty brawler he resembled in the ring and learn how to be a crafty son of a gun – the "dirtiest player in the game." 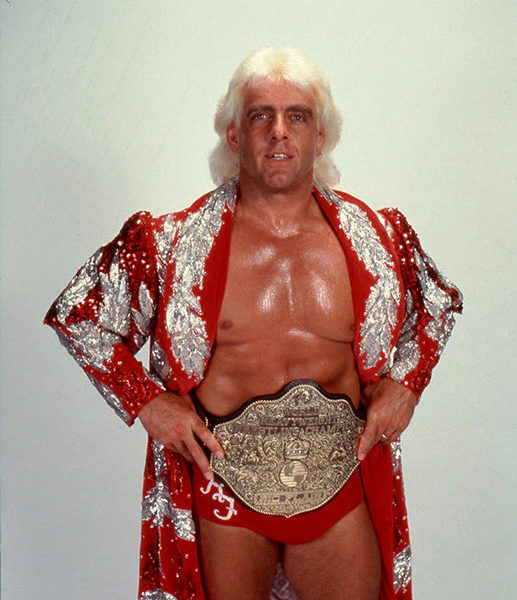 Remarkably, Flair returned to NWA after six months of physical therapy. He won the NWA United States Championship multiple times and picked fights with future legends Ricky Steamboat, Roddy Piper and Jimmy Snuka. 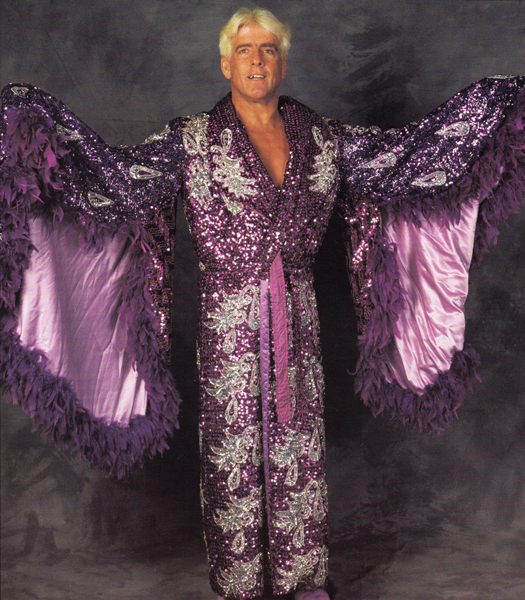 In 1978, "The Nature Boy" was officially born when Flair challenged the original "Nature Boy," Buddy Rogers. Three years later, he reached new heights by defeating Rhodes for his first NWA World Heavyweight Championship. 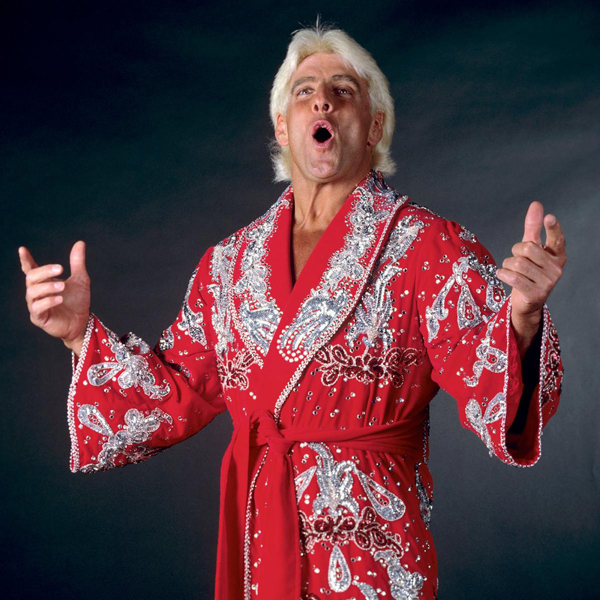 Along with the title, Flair's signature look started to fall into place: designer suits, outlandish robes, and of course, shoes that cost more than your house. 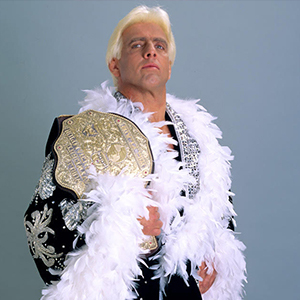 As the decade progressed, so did Flair. The spring of '85 brought the creation of The Four Horsemen, one of the most dominant groups of all time. With Arn Anderson, Ole Anderson and Tully Blanchard by his side, Flair would further cement his legacy when World Championship Wrestling was formed. Classic matches with Steamboat, Terry Funk and Sting ensued, as Flair became the first WCW World Heavyweight Champion while still holding the NWA title. A dispute with then-WCW president Jim Herd in 1991 led "The Nature Boy" to his initial stint in WWE where he would claim his first WWE Championship by lasting nearly 60 minutes in the 1992 Royal Rumble, then win it a second time by toppling Randy Savage. Flair once described this period as "the greatest year-and-a-half of his career" outside of his time spent with The Four Horsemen. After returning to WCW in 1993, Slick Ric took on numerous title contenders and led the charge during the notorious invasion of the New World Order. While Monday Nitro became a black-and-white stomping ground, it also featured some of Flair's most memorable moments yet. He did whatever it took to get his way, even if it meant stripping in front of a live crowd and handcuffing himself to the ring. Over 50 but still energetic as ever, Flair had an impactful second stint with WWE from 2001 to 2009, doing everything from co-owning WWE for a stretch to joining forces with Triple H to form Evolution. A day before competing in a final, punishing WrestleMania match against Shawn Michaels in 2008, Flair became the first active performer to be inducted into the WWE Hall of Fame. He became the only two-time inductee in 2012, joining his compatriots in The Four Horsemen in the hallowed Hall. 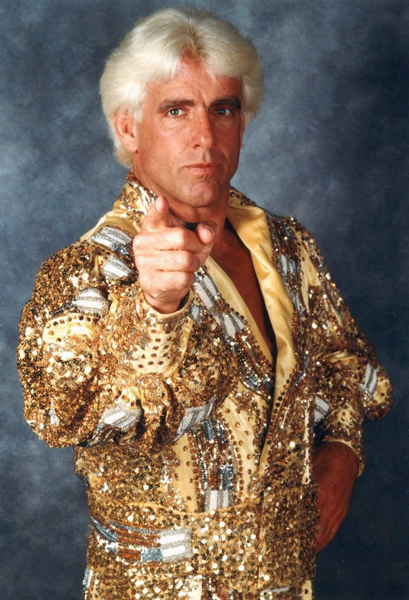 Waiting for Flair to retire first before enshrinement would have been a futile move. Four decades of proof have shown there is no quit in the self-proclaimed "Secretariat in Disguise."